Ask and you shall receive. I’ve gotten many requests for same/different or compare/contrast materials. So, I’ve made just that! Not to mention, I’ve seen an influx of holiday/seasonal downloads that I thought it was time for a generic pack that can be used all year long without any strange looks from kids. 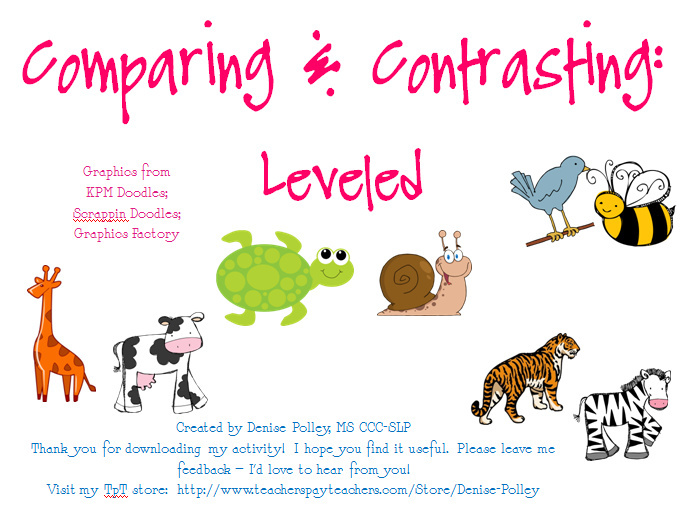 I’ve also had a great response from having leveled/scaffolded/differentiated materials, and this one has that as well. Here’s a look at it! I actually made this activity in preparation for a student who is about to be on my caseload, but her IEP has not yet been completed. She is in third grade, so I will start with the easier concepts (level 1) and move to more challenging items (level 2) as she becomes better at describing the relationship between objects. Not only is level 1 easier because it contains visuals, but the concepts involved are also more straight forward. Here is an example. 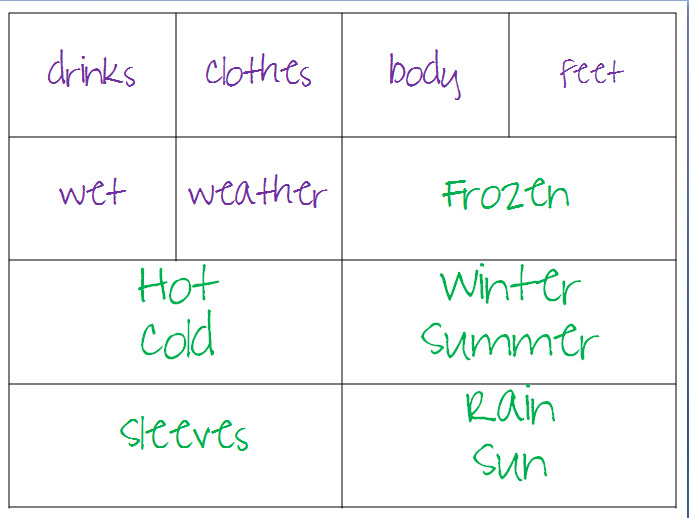 Similarities are on the smaller cards in purple writing; differences are on the longer cards with green writing. 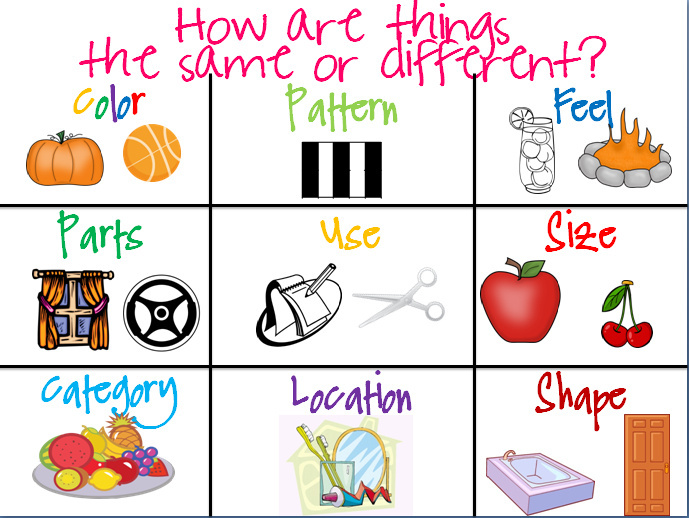 I’ve also made this poster to teach (and use as a visual prompt and fade your verbal prompts) to illustrate the most likely ways that objects are similar to and different from each other. If a student is having trouble, it will be helpful to just point to the box on this poster that is applicable to the pair of objects rather than giving verbal prompts. Hopefully he/she will be able to come up with a reason with just this visual! Find it here at my TPT store! It is currently on sale! Price will go up on Monday 10/22. I’d love to hear how you like this latest download and how it’s working with your students! Cute! I added it to my wishlist! Awesome! I actually just updated it to add some extra cues for teaching to level 1! Very cute! I like how you've leveled it…and that you have current items (like Facebook) on the cards. Looks like a great packet. Click here if you’d like to start using Smarty Symbols in your therapy room! Copyright © 2019 — Speech Language Pirates • All rights reserved.